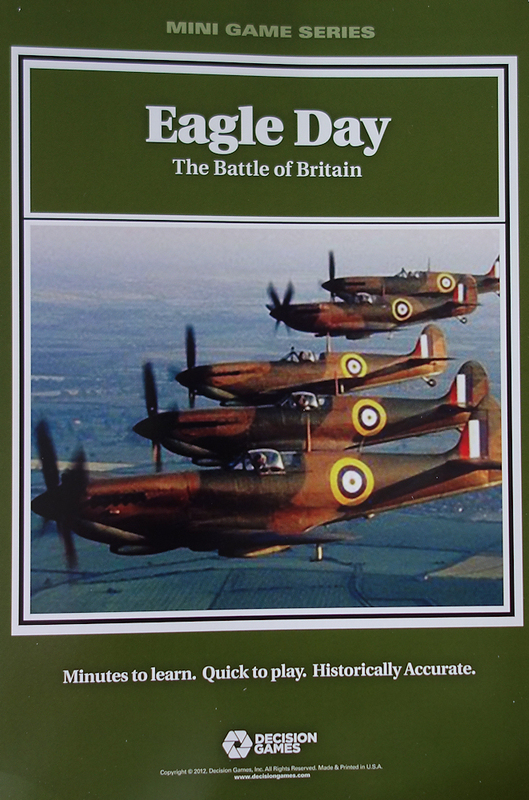 and this particular game covers five critical days from the Battle of Britain 1940. The following is an AAR that also explains the system. Basic outline of play - The scenario rules state the number of days represented in the game and also how many operation hours there are in each day. In this game, it is a 5 day game with each day being divided into 8 operational hours. At the start of each day there is a planning phase, which allows the players to add cards to their hand, get reinforcements and re-deploy. (note this is not a card driven game. The cards support play). The Operations Phase follows, in which each hour (remember there are 8) is played as a sub-sequence of flying, air combat, receiving AA fire and bombing, with the ‘intruder’ going first and the ‘interceptor’ going second. 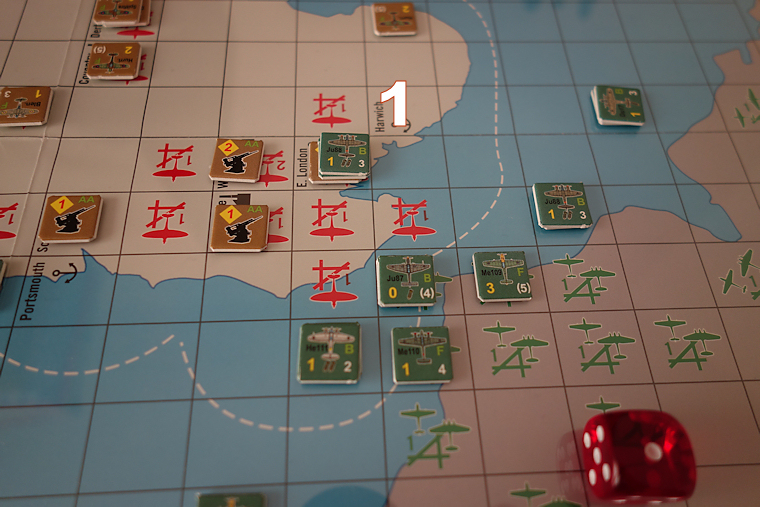 For the German player, victory is based around the number of aircraft factories and naval bases that get successfully bombed, plus damage to British aircraft. The RAF gain VP’s purely from causing damage to the German air force. At the end of play, the differential in points determines who has won. The following gives some details of how turn 1 played out and demonstrates the system and sequence of play. The subsequent 4 turns are then discussed briefly. This is the game map (11" x 17") showing airfields, target ports and target aircraft factories. Planning phase - Both sides draw cards equal to their Command Levels (4 British and 3 German). There are no reinforcements (these are essentially returning units from the damage and abort boxes) on Day 1 and neither side seeks to re-deploy, being happy with their setup. FLY. The Germans send Ju88’s and Me109’s to East London. Mostly everything else takes off and re-organises into small stacks (stacking allowance equals the command level). The Ju87’s move up to a now vacated coastal airfield so that they can be used in the next turn. They are short range aircraft, so will only be able to stay airborne for 2 hours (though short range air units can make more than 1 sortie per day). 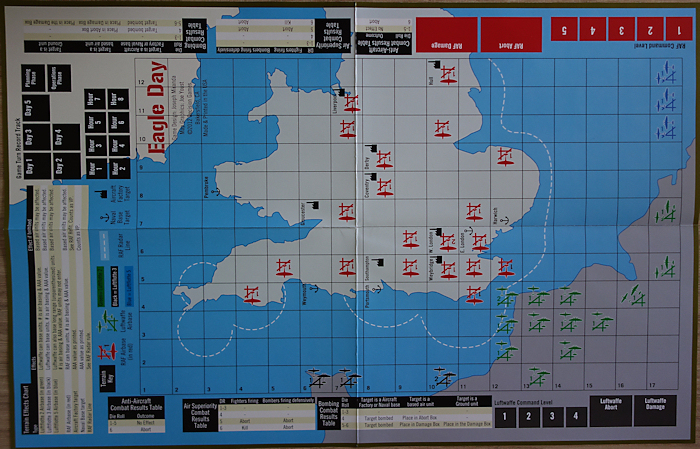 AIR COMBAT - none, as there are no squares currently containing air units of both sides. AA FIRE - The German Ju88 and Me109 units are over East London, which has an Airfield printed on the map containing an AA capacity with the value of 1 and also there is an AA unit there with a value of 2. Combat values in this game basically indicate the number of dice the player rolls - in this instance 3. The defenders need sixes to hit and they get 1 hit. AA hits are always treated as ‘abort’ results (which puts the air unit into the abort box). The German player chooses to remove the Me109 fighter unit. BOMBING - Only the above mentioned German unit is in a location that can be bombed. It has a bombing value of 2, so rolls two dice. It can choose whether to attack the docks or the AA unit that is also in the location. The docks are chosen, the dice are rolled and one die scores 4 or more, so the bombing raid is considered successful and the East London Naval Base target is marked off on the target roster sheet (photocopied) as having been attacked. 2. Luftflotte 2, a good springboard for the early attacks into the SE of England. 7. This white line indicates the radar effective range (two player game). RAF part of the turn. The British player runs through the same sequence of play as just undertaken by the German player. They play the ‘Squadron Forward’ card from their hand, which increases the range of their short ranged aircraft by 1 square for the rest of the day. FLY - Hurricanes take off from Hull to fly out into the North Sea to hit the incoming He115 / Me109 stack. Hurricanes from Coventry meet the Ju88’s near Portsmouth and Hurricanes from above the Norwich area of the map (not marked as such) go out to sea to meet approaching Dornier 17’s (2 units). AIR COMBAT - At Portsmouth the air battle does not produce any result, all units remain in play. Against the Dorniers things do not go well and it is the Hurricane unit that receives an abort result (and is removed to the abort box - all aborted units are able to re-deploy in the next turn). The Hurricanes from Hull receive a ‘kill’ result from the German Me110 fighter unit and it is placed in the damaged box, but as combat is simultaneous, they get to fire and they inflict 1 abort result, which the Me110 takes so that the He115 bomber unit can continue with its mission. AA PHASE - not relevant as the RAF are not over any German airfields (which have an intrinsic AA value) and the Germans do not have AA units. BOMBING PHASE - not relevant, though note that RAF units can fly to enemy airbases and attack, it’s just that in this game there are never enough of them to defend the UK, never mind going wandering abroad! Day 1, 1st Hour Operations, German part of the turn. 1. The only German units (Ju88 and Me109)to reach a target this hour are over East London Naval Base. There is an airfield in the same square plus an AA unit. The left number (yellow) is the air combat value and the right hand number (white) is the movement allowance. The symbols between those two numbers represent the bombing value of the unit. Now that the system has been explained in some detail, this account will now proceed as a brief AAR. German Me109’s leave the coast to give overhead cover to SE England. The Germans play the ‘KG-100’ card that allows their bombing values just for this current hour to be increased by 1. The RAF play their ‘ACES’ card, allowing their fighters (for this hour only) to have their fighter strengths increased. Outcomes - Weybridge, Portsmouth and Harwich are bombed. The RAF lose 2 spitfires and 1 Hurricane as kill results and the Germans suffer 1 kill (Ju88) and 1 abort (Ju87). All in all, that seemed an hour that went in the German favour. West London is bombed, 1 AA unit is sent to the damaged box and the 1st wave of German attacks on Hull fail. At this point there is not much the British can do. They have 2 weak air units that will just not be able to stand up against the German ME 109 fighters. Most German bombers are now flying back towards their own airfields. There is just the 2nd attack wave to strike at Hull. Just comprise of German units returning to base. SPLASH! the German He111 unit is still at sea, so cannot land before the days end and so is removed to the damaged box. The game has cards but they support rather than drive the system. German air strength is back to full. The RAF still have 2 Hurricane units out of play and have a permanently removed AA unit. 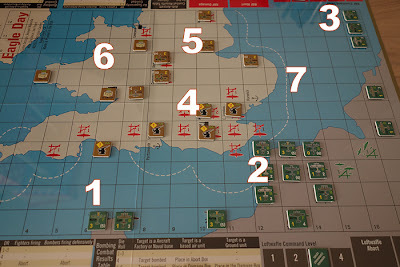 The Germans plan to strike at Pembroke and Weymouth naval bases this turn, so that they can claim success against all 5 navel bases on the target roster and thus claim an additional 2 VP’s for doing that. They will also target Coventry. Results, 1 spitfire to the damaged box and a spitfire together with a Hurricane goes into the abort box. The Germans lose a Dornier 17 unit and Me110 unit to the damaged box and a He111 and a Me110 to the abort box. 3rd Hour - As the Ju88’s get over Southampton, one unit attacks the city (fails) and the other attacks the AA unit on the ground, which is hit and moved to the damaged box. 4th Hour - Dorniers are driven off (abort) at Coventry. 5th hour - nothing else is left in the skies, so the day ends. The targets now needed by the German sides are deeper into UK territory, over on the western side. This is beyond the range of some German air units, so they will not be used today. Of those that do have the speed to make the journey in the 8 operational phases, they will attack Gloucester, Weymouth and Southampton. The British get their 2 Spitfire units back. He111’s take an unavoidable risk in flying over Weymouth (itself a target of another German formation) to reach Gloucester. They survive the AA reception at Weymouth. But in the British part of the turn, a Spitfire unit halts them by causing 1 unit to abort and the other is hit and sent to the damaged box - the Spitfire unit survives the contact - interception at its best. In the subsequent hour, the Dorniers run into the same Spitfire group and after fire is exchanged, both the Spitfire unit and one Dornier unit go into their respective damaged boxes. Results - Weymouth, Coventry and Gloucester are bombed. An AA unit and Blenheim fighter unit both go into the damaged box. Another bad day for the British side. The RAF only have 1 Spitfire unit and 1 Hurricane unit available, everything else is in the damaged box and the British player is just not getting the cards that might help bring some of those units back into action. Results - Southampton, Coventry, Pembroke are bombed. An RAF HQ is sent to the damaged box, so their Command level drops by 1 (to 3, so they can now only have a hand of 3 cards). To complete their campaign objectives, the German must raid Derby and Liverpool (in the middle part of the UK map above). Air defences are again down to just 1 Hurricane and 1 Spitfire unit. The intended targets are obvious, so the RAF units are placed in and around Coventry to easily intercept those lines of attack. Two out of the three German attack groups make it through (the two stacks nearest the red die) to the cities and each is bombed. 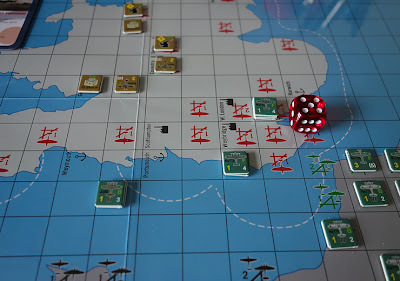 The victory points are calculated, including the bonus points for achieving all targets and the score substantially favours the Germans who claim a Strategic Victory. I have always been a big fan of mini games and it is great to see Decision Games supporting the format. The game cost £11 in the UK (June 2013). Solitaire - It is described as a two player game, though the solitaire rating on the back of the package gives it 4 stars out of 5 for solitaire playability. I played the above replay solitaire without any difficulty but you do lose the significance of radar and the help of the decoy RAF units. Size - The map is around a quarter size of a traditional wargame map and there are just 40 counters. The cards are around two and a half inches deep, there being just 18 of them in the game. This really is a compact game and is ideal for the desk top or as a travel game for a vacation. Time - The package says 1 - 2 hours but I would say nearer the 2 is more likely and perhaps even a little more. I like the system, it seems to work fine with this particular scenario subject matter, it will be interesting to see how different the Solomons game will be (Cactus Airforce). The game plays a little faster once the first couple of turns are out of the way and players are only using those aircraft that allow for the deeper raids. I felt is was very hard for the British player to score VP’s as it is only the number of damaged units that are still damaged at the end of the game that count for victory. In my game the Germans did not seem to have much trouble in re-cycling units back out of the damaged box during play. It certainly needs more plays on my part to see whether the random effects of die rolls and cards effects level out to produce a wider range of final VP results. I’m not generally a big fan of small counters, but if I am going to have them, then I want the map ‘cells’ large enough to take them and in this regard the square grid is a decent size. I would have preferred the rules to have been in small booklet form rather than the larger format folded down and a slightly larger ziplock bag would be handier but these are just two VERY minor quibbles in what is a very nice and successful package. Well done DG for something refreshing and accessible. As an aside, this game could look very nice at a wargame show, with the map enlarged and 1/600 scale models (from Tumbling Dice) on it. A second playing turned the first result right on its head. The Germans suffered very heavily on day one and the casualties just piled up on day two. Over the same period RAF casualties were quite light, so they were then able to concentrate their attacks against the fewer German attacks with increasing odds of doing harm. Such were the RAF successes, that on one occasion, they hopped across the channel and attacked an airfield that had returned bombers sitting on it. On Day 4 the RAF took some heavy losses and with a bloodied nose, things calmed down for the rest of the game. Both sides suffered a morale drop (due to mid game losses), which reduced the cards in the players hands. The end result was that the Germans had hit all of their naval targets but only four of their factory targets. They had 14 units in the damaged box (ouch), Resulting in a very substantial British strategic victory. The game concluded in 1 hour and 5 minutes, playing faster because the number of units had so drastically thinned. Played face to face today. This allowed us to use the 3 dummy RAF air units and invert the AA and HQ counters. 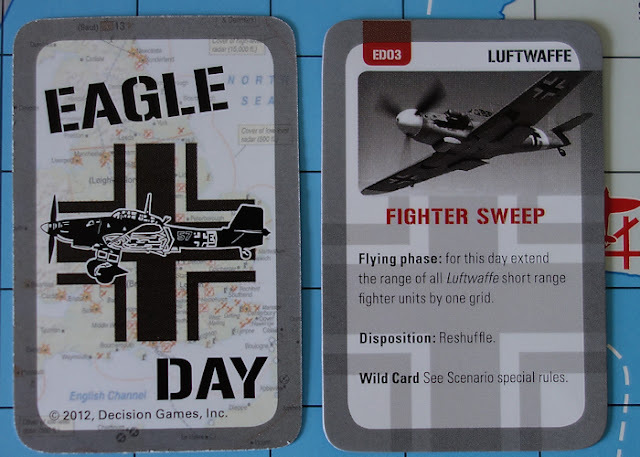 We also made more use of the flipped counters to show their based side, but only when based, not when flying. Overall, I’m not sure that this 'extra' fog of war actually made that much difference compared to it’s absence in my solitaire games. It becomes pretty obvious where the AA units were and by deduction, where the HQ units were. Also the radar zone is so close to the German airfields, that in any case, once the Germans fly off in their first hour, their identity is generally known anyway. The dummy units do benefit the RAF but only marginally. It was another good game. The Germans had more than their fair share of poor die rolls and didn’t get much access to their reinforcement cards. As a consequence, their damage box became quite full, which in turn caused a morale drop. By days 4 and 5, they didn’t really have the strength to force their way through to the deeper targets needed to get enough VP’s to win or to negate their heavy losses. We both enjoyed the game, which took us around two hours to play (at a leisurely pace). Great write-up as usual Norm. Have you played other BoB games...I was wondering how this compared for e.g. to TSR's Battle of Britain (not the SPI one) that came in a large box with spitfire and me 109's on flight stands. It was a game I really liked that was card driven (for the Luftwaffe targets IIRC. Hi Dave, thanks. No, I have not really been attracted to air games that much. I did have GDW's Blue Max years ago (WWI) and that was fun, but that's about it. 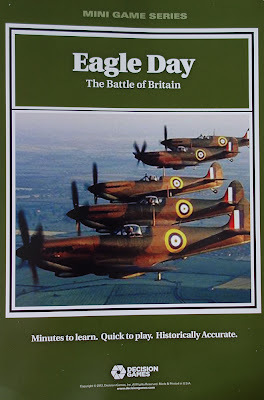 I remember a game by Attactix that covered the Battle of Britain, perhaps at the same level as eagle day. I would enjoy hearing comments from anyone who actually played that game. How was the die-cutting alignment for Cactus Air Force in your copy of the game? The pics on BGG showed quite a bit of misalignment with several of the twin engined aircraft missing the nose glazing. Mine are all pretty much spot on, there are a couple of examples of slight drifting towards the left side of the counter but everything is properly intact. Until you mentioned it, I would not have given them a second look. This game and Cactus Air Force landed here yesterday and I am looking forward to trying them out. I would have thought that Decision Games could have included a Stuka unit and a "Channel Convoy" target (Maybe there could be a variant here). Hello Dave, I hope you like the games, I note a couple of comments on CSW in which some have not. I think they are quite fun little games and like your idea re a channel convoy target or some such. Both games could actually do with the numbers of cards expanding to increase options without any extra rules overhead. I see just having 9 cards per side as the biggest limitation of the mini series.